"Software that allows you to access and control your Android device through your Internet browser." Ever wanted to have a bit more control over your phone while you are busy at the office or at home on your PC? Using Airdroid, you can have full access of your phone without ever having to pick it up. You access your phone through any one of your Internet browsers and can access your apps, text messages, and more. This makes it easier to multitask while also using your cell phone features all on your PC. Once you install Airdroid, all you have to do is type in your phone's IP address on your local network and the password the app give you to access your phone through the browser. You type in this IP address and port in your Internet browser, enter your password, and then you have full access of your Android device straight through your Internet browser on your PC. 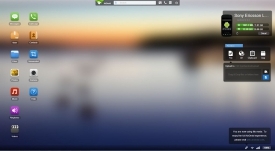 The Airdroid homescreen you will see through your browser looks very similar to the homescreen on your phone. It will also give you statistics of your usage on your device, as well as the wifi connection strength and power left in your battery. You can also access your phone storage and the files on your phone. Managing your files is actually easier than on your Android device since you can see and move around your files much quicker than in the file manager on your Android. You can send and receiving text messages from your Android device through the Messages application within Airdroid. Any new messaging that come in, Airdroid will notify you on your desktop so you don't miss a message while you are busy on your PC. You can also enter contact info and send any of your contacts messages through the app as well, just as you would expect. Airdroid is probably the best and easiest way to access your device on your computer to have all of your information in one place while you are busy doing your work.